A compelling exploration of how reputation affects every aspect of contemporary life Reputation touches almost everything, guiding our behavior and choices in countless ways. But it is also shrouded in mystery. Why is it so powerful when the criteria by which people and things are defined as good or bad often appear to be arbitrary? Why do we care so much about how others see us that we may even do irrational and harmful things to try to influence their opinion? In this engaging book, Gloria Origgi draws on philosophy, social psychology, sociology, economics, literature, and history to offer an illuminating account of an important yet oddly neglected subject. Origgi examines the influence of the Internet and social media, as well as the countless ranking systems that characterize modern society and contribute to the creation of formal and informal reputations in our social relations, in business, in politics, in academia, and even in wine. She highlights the importance of reputation to the effective functioning of the economy and e-commerce. 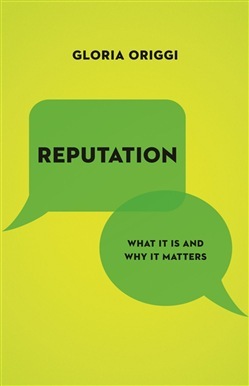 Origgi also discusses the existential significance of our obsession with reputation, concluding that an awareness of the relationship between our reputation and our actions empowers us to better understand who we are and why we do what we do. Compellingly written and filled with surprising insights, Reputation pins down an elusive subject that affects everyone. Acquista Reputation in Epub: dopo aver letto l’ebook Reputation di Gloria Origgi ti invitiamo a lasciarci una Recensione qui sotto: sarà utile agli utenti che non abbiano ancora letto questo libro e che vogliano avere delle opinioni altrui. L’opinione su di un libro è molto soggettiva e per questo leggere eventuali recensioni negative non ci dovrà frenare dall’acquisto, anzi dovrà spingerci ad acquistare il libro in fretta per poter dire la nostra ed eventualmente smentire quanto commentato da altri, contribuendo ad arricchire più possibile i commenti e dare sempre più spunti di confronto al pubblico online.